Peter Monamy was born in London to a merchant family. He was apprenticed to a house painter (a 'painter-stainer') and may well have taken over the business on the death of his master. By the early 1720s Monamy had become an established studio painter based in Westminster. He specialised in marine works and made numerous trips to observe vessels at sea and at anchor. 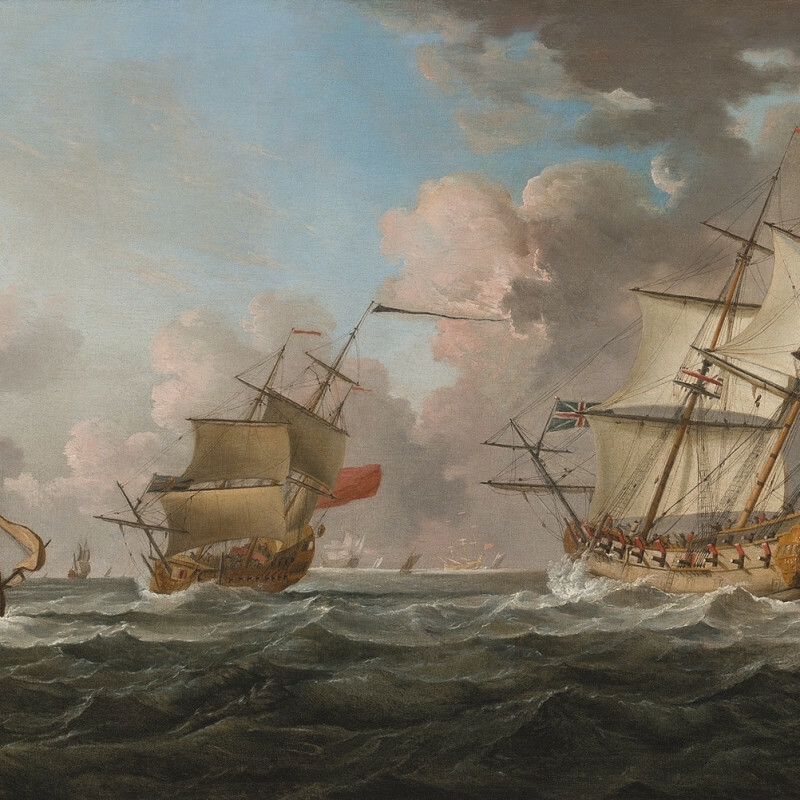 His career coincided with a period of rapid growth in British naval power, and his work responded quickly to significant seafaring events, with Monamy painting several versions of Admiral Vernon's 1740 capture of Porto Bello, for example, one of which was singled out for attention by the Prince of Wales and Princess Augusta at a public display. Monamy's accurate depiction of technical shipping details, including rigging and sails, and his attention to weather, made his work admired and sought after in naval circles. His paintings were reproduced widely, during his lifetime and well into the nineteenth century. Yesterday Evening was buried at St. Margaret's Westminster, Mr.Peter Monamy, greatly eminent for his Skill in Painting Sea Pieces; in which Art, as he was not equall'd by any of his Cotemporaries [sic], neither was he excell'd by many of the Ancients; but his Name and Character are too well known and establish'd among the Curious to need any artful Commendation to set them in greater Light to advance his Merit; neither can the warmest Praise add to his Fame when dead, who, in his Life, was the greatest Enemy to Adulation; and tho' some Notice is due to the Memory of so celebrated an Artist in Painting, yet his own Performances, which are extant in the World, will prove his most lasting Monument.